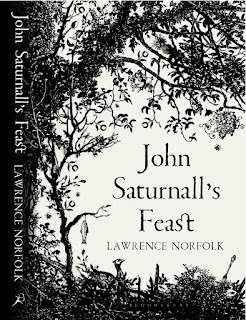 John Saturnall's Feast by Lawrence Norfolk reads like a blend of historical fiction and fantasy, and had enormous potential but didn't quite hit the giddy heights I was hoping for. Set in 1625, John Sandall and his mother flee their small town after the villagers claim his mother is a witch. Seeking shelter for the winter in an abandoned stone building in the woods, his mother shares with John the story of an ancient Feast; elegantly illustrated in a book his mother has always held dear and the only possession they have left. John later finds himself in Buckland Manor and is given a job in the mammoth kitchens. It was here that John Saturnall's Feast really took off for me. I was enchanted by the goings on of the kitchen: the dishes being prepared, the utensils and methods used, the expanse of rooms and the seemingly organised chaos required to prepare the meals every day for Sir William Fremantle and his family. His daughter refuses to eat when she is upset and soon begins one of her fasts and it falls to John to tempt her to break her fast with one of his dishes. This is an exciting plot line in of itself but soon the household is off to war and the novel lost me after that. "Next take cold Cream, warm Honey and a Ladder. Climb the Ladder. Pour the Honey and Cream at a Fall into a Pot of Gascon Wine and let it froth, the higher the better. Whisk the sweetened Cream until it stands in melting Peaks." Page 237. I wanted this book to be so much more, but sadly it just didn't get there for me. I wanted more time spent in the kitchens and less time on the battlefield, however this is just one reader's opinion.